A quiet revolution has occurred in the electricity generation during the last few years. 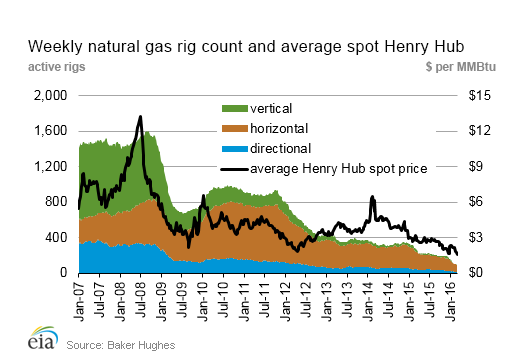 Due to large discoveries of natural gas in the Marcellus (Pennsylvania, West Virginia), the Utica (Ohio), the Haynesville (Louisiana), the Barnett (north Texas), and the Eagle Ford (south Texas), natural gas prices have dropped so far they routinely compete with or beat coal prices. 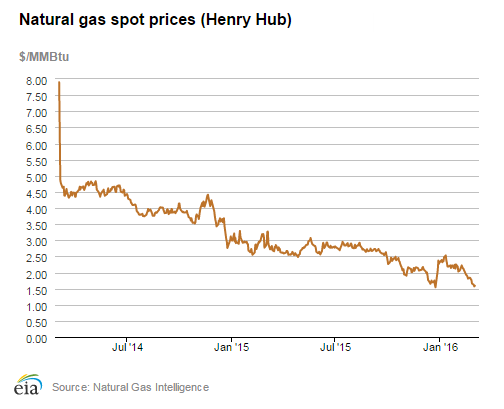 In places like Pennsylvania that have insufficient pipeline capacity, natural gas drilling has declined but prices have still fallen as low as $1.00/thousand cubic feet (MCF). To remedy the gas supply-demand mismatch, several things have occurred. The first is price signaling—prices instantaneously drop to market-clearing (pre-1980s deregulation it required months or years for price signals to travel from the market to drillers. Most drillers didn't even know the identities of their largest customers.) Low prices have reduced short-term gas drilling and will reduce gas drilling longer term by causing some companies to restructure or go out of business. The second factor has been increased marketing. People like Oklahoma's Aubrey McClendon began promoting the use of natural gas not only in electricity and heating but as CNG fuel for buses and cars. A third factor is export. The first cargo of liquefied natural gas (LNG) was just exported from the United States. Exports are no panacea; the global LNG market is quite competitive with gas supply from Qatar, Australia, Algeria, and other areas. Moreover, building liquefaction facilities requires billions in capital. The fourth factor is completely random but hugely important: weather. The colder the winter, the more natural gas is consumed for heating. 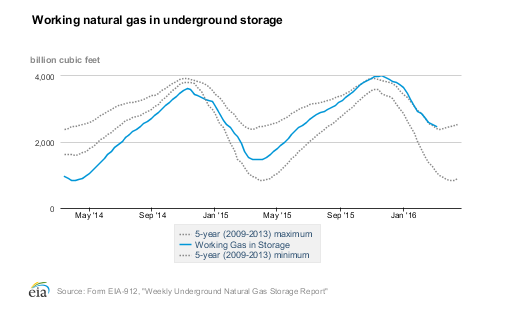 The winter of 2014-2015 was cold enough to draw down stocks in storage to normal levels; the winter of 2015-2016 has been so mild that storage levels are at all-time highs for this point in the year (before filling starts)—so much so that the ability to put gas in underground storage caverns will be limited until next winter.